Microsoft is placed in the Leaders Quadrant of Gartner Research (October 13, 2011), which looks at the enterprise content management market and how Gartner rates vendors and their packaged ECM products. According to Gartner “Changing delivery models, new value propositions, solution configurations and partner ecosystems make ECM relevant to every business.”. ECM has a rich history going back almost 30 years to the introduction of computer networks and document scanners to build the first document image processing applications. Functional elements such as the repository, scanning and capture tools, and workflow engines were often sourced from several vendors since full suites were rare. That changed during the late 1990s as IBM and others built out suites of technology to bring an integrated offering to bear. In the early 2000s, the impact of the Web hit ECM, and the concept of managing Web content and websites as user-friendly assets came under the ECM umbrella. By the mid 2000s, the market started experimenting with Microsoft's SharePoint 2003 as a low-end collaborative content management environment and those experiments got more serious by the time SharePoint 2007 was deployed. At the same time, other vendors were going through waves of acquisition — large vendors like EMC bought Documentum, IBM bought FileNet and then Oracle bought Stellent. Now, with four major vendors scrambling for ECM sales, the market really became a battleground post 2008. These top vendors control close to half the revenue of the ECM market today. · The Cloud. Public cloud deployments of ECM allow enterprises the flexibility of launching new content initiatives quickly with no upfront costs for servers, system integrators and (usually) software licenses. The enterprise pays a per-user fee, and perhaps a fee for the volume of documents stored, and can reduce the size of a deployment, when needed. Today, this is often best suited to ECM needs that are more basic, such as advanced file server use cases, where customization and integration are not needed. · Mobility. Given the clear demand for anywhere access and the rise of smartphones and tablets, ECM systems are deploying very functional clients for these devices in a post-PC era. In addition to simple use cases like repository access to documents, many vendors are developing interfaces for participation in process approvals and exception handling, camera-image (both still and video) and bar code inputs, case management system interfaces and, of course, the ability to maintain presence awareness of mobile users in an ECM system. · Analytics. Content analytics defines a family of technologies that processes content and the behavior of users in consuming content to derive answers to specific questions. Content types include text of all kinds, such as documents, blogs, news sites, customer conversations (both audio and text), and social network discussions. Analytic approaches include text analytics, rich media and speech analytics, and behavioral analytics. As enterprises bring more of their content under the control of an ECM tool, they want to gain more valuable insights from the usage patterns, the latent knowledge in the content as well as the social interactions that occur during the collaborative creation and dissemination of the content. · Big Content. Commonly accepted consumer file formats like audio and video have made their way into the enterprise and ECM systems are being leveraged to manage them in conjunction with many other file types. Enterprises seek to create a simpler view into a client or an issue which is agnostic of file type, and ECM tools are rising to the occasion. Big content refers both to the growth in size of repositories that organizations are able to achieve as file formats get larger, and also to the growth in diversity of content types. The world is getting bigger in terms of absolute quantities of content that enterprises must manage as well as diversity. These new forces of change are having an effect on the solutions that vendors are building and they will spawn further new solutions. Gartner sees the market shifting toward four collections of technologies to suit them. Changing delivery models, new value propositions, solution configurations and partner ecosystems make ECM relevant to every business. Understanding the four usage scenarios of ECM can help put enterprises on the path to success. Very few vendors have market-leading emphasis and ability in all four. Though many implementations span several scenarios, almost all will have to relate to content management as infrastructure. 1. Transactional content management solutions focus on imaging, workflow/business process management (BPM), compliance/archives, records management and e-forms. Content contained within applications in this category tends to be static, rather than dynamic, though this may change as XML representations become more common. Processes tend to be stable, long-running and have a high volume of forms or documents that demand scalability, life cycle control and human approval, primarily for exceptions. An application interface is almost guaranteed. CCAs like those for invoice automation, case management frameworks, and other horizontal and vertical market templates and solutions are key considerations in vendor selection. Examples of solutions include offerings for customer communications management, processing of loan applications and electronic patient files. Sample vendors: EMC, Hyland Software, IBM, OpenText, Perceptive Software, Saperion. 2. Social content management solutions focus on compound content object control and library services; document collaboration; workflow automation with alerts and calendaring; social content like wikis, blogs and videos; task tracking; browser or portal viewing; markup, annotation and version control. The focus is on systems of engagement — orchestrating high-value people involved in the project-based or long-running development and delivery of high-value documents, content or knowledge management, and optimizing the processes, interfaces and objectives that relate them through collaboration. Examples of these solutions include offerings for new drug discovery, new hire recruiting, onboarding and training, and construction project management. 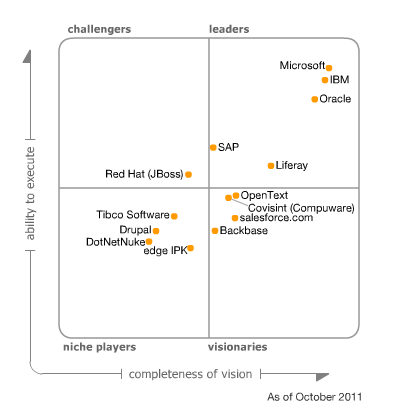 Sample vendors: Alfresco, IBM, Microsoft, OpenText. 3. Online channel optimization solutions focus on Web channel sets of technology, including WCM, DAM, portals, electronic forms, Web and content analytics, social software, XML authoring, rich-media management, social content and collaboration, mobile device support and so on. The aim is to "idealize" them to serve as Web-delivered, context-aware engagement platforms for a variety of industry-focused solutions. Most important in delivering value will be a focus on relevancy and consequent measurable increases in the impact of the delivered experience. Examples of templates or solutions to engage customers more fully include online retail optimization, Web channel distributed claims processing, and constituency self-service in government. Sample vendors: Adobe, OpenText, Oracle. 4. Content management as infrastructure solutions are increasingly being delivered by infrastructure vendors such as IBM, Oracle and Microsoft, which are embedding content management capabilities into their stacks. They are also increasingly becoming infrastructure platforms for supporting multiple CCAs. For example, when Microsoft SharePoint takes hold in an organization, users naturally begin exploring its suitability for a wider range of content management applications and its potential as a replacement for existing solutions. Essential considerations for this category include abilities to manage rich metadata, enable full life cycle control, allow easier migrations from other repositories, network drives or file servers, and to bring some analytic or business intelligence-like capability to unstructured data overall. Understanding how content relates to larger enterprise information management disciplines will also become critical. Sample vendors: IBM, Microsoft, Oracle. ECM, defined as a strategy, can help enterprises take control of their content and, in so doing, boost effectiveness, encourage collaboration and make information easier to share. ECM, defined as software, consists of a set of capabilities and/or applications for content life cycle management that interoperate, but that can also be sold and used separately. The core components of an ECM suite and the updated weights for the Magic Quadrant scoring are described below. Document management for check-in/check-out, version control, security and library services for business documents. Advanced capabilities such as compound document support and content replication score more highly than do basic library services. Web content management (WCM) for controlling the content of a website through the use of specific management tools based on a core repository. This includes content creation functions, such as templating, workflow and change management, and content deployment functions that deliver prepackaged or on-demand content to Web servers. The minimum requirement is a formal partnership with a WCM provider. Native capabilities score more highly than partnerships. The relative complexities of provisioning content to users across intranet, extranet and Internet applications are also considered, as are the implications of analytics, social content and delivery models. Several ECM vendors qualify for independent analysis of their WCM functionality (see "Magic Quadrant for Web Content Management"). Records management for long-term retention of content through automation and policies, ensuring legal, regulatory and industry compliance. The minimum requirement is an ability to enforce retention of critical business documents, based on a records retention schedule. Higher ratings are given for certified compliance with standards such as the Department of Defense (DoD) Directive 5015.2-STD, The National Archives (TNA), the Victorian Electronic Records Strategy (VERS) and Model Requirements for the Management of Electronic Records (MoReq2). Several ECM vendors qualify for independent analysis of their records management functionality (see "MarketScope for Records Management"). Image-processing applications for capturing, transforming and managing images of paper documents. For this component we require a vendor to offer two things: (1) document capture (scanning hardware and software, optical and intelligent character recognition technologies, and form-processing technology) performed either using native capabilities or through a formal partnership with a third-party solution provider such as KnowledgeLake, Kofax, EMC (Captiva) and IBM (Datacap); (2) the ability to store images of scanned documents in the repository as "just another" content type in a folder, and to route them through an electronic process. Extra credit is granted for vertical or horizontal solutions delivered directly or through partners. Several ECM vendors qualify for independent analysis of their image-processing functionality (see "Critical Capabilities for Composite Content Applications: Case Management"). Social content for document sharing, collaboration and knowledge management, and for supporting project teams. Blogs, wikis and support for other online interactions have been added. Social content — including video — is the fastest-growing category of new content in the enterprise. The name of this component has been changed from "document collaboration" to "social content" to reflect broader audience and content types. Workflow/business process management (BPM) for supporting business processes, routing content, assigning work tasks and states, and creating audit trails. The minimum requirement is simple document review and approval workflow. Higher scores are given to vendors with graphical process builders, and both serial and parallel routing. Many vendors are drawing on stronger process capabilities to deliver frameworks or templates as CCAs. Several ECM vendors qualify for independent analysis of their workflow/BPM functionality (see "Magic Quadrant for Business Process Management Suites"). Extended components can include one or more of the following: DAM, document composition, e-forms, search, content and Web analytics, email and information archiving, email management and packaged application integration. See "Evaluating ECM Using the Magic Quadrant for Enterprise Content Management 2010." Software Innovation is a Scandinavian company specializing in ECM from a composite content application perspective. We have removed Autonomy because it is not actively promoting any products as ECM; rather, it focuses on meaning-based computing. We have removed Xythos Software, a Blackboard company, because we have seen no client interest in its content management technology, nor have we seen any promotional efforts, since 2010. You can enjoy reading the full Gartner Report here. SharePoint 2010 Continues to Lead Gartner Magic Quadrant for Horizontal Portals for as per Gartner (October 2011 ), Gartner positions Microsoft in the Leaders Quadrant on the 2011 Magic Quadrant for Horizontal Portals based on an evaluation of completeness of vision and ability to execute. 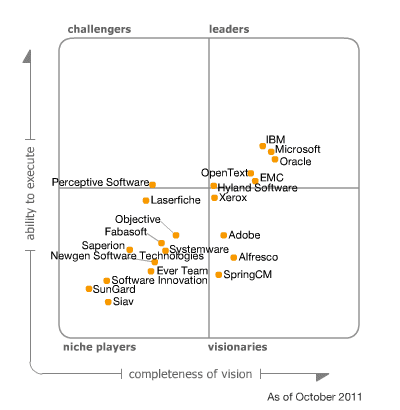 SharePoint 2010 gets a better position in the magic quadrant compared to 2010 report (for 2010 report click here). Microsoft SharePoint's sweeping growth in the portal market is largely a factor of its appeal to business users, rather than the portal's IT owners. Until recently, most portal providers appealed to enterprise IT leaders first, often emphasizing the security and compliance counterpoints to this new, flexible, yet seemingly risky, user-centricity. Gartner client discussions point to significantly altered portal emphases in recent years. Whereas portal initiatives often involve aggregating and delivering information sources and extending business applications and processes, new portal customers recognize that they must engage end users to ensure the success of their portal efforts. Organizations are finding that older portals do not (or never did) garner significant adoption and loyalty from end users, which has led to significant portal failure and stagnancy. Consumerization is largely responsible for this trend, with Web consumers and information workers bringing greater expectations into the workplace. Consumers have far different expectations of their organizations' portals and websites than what they had only a few years ago. They expect portals to be highly personalized, engaging, social, accessible, mobile, easy-to-use and synchronized across a wide range of channels. In the meantime, users and consumers have a choice: If they don't like what their business gives them to support their information and collaboration needs, they can easily use consumer mechanisms, ranging from Google Documents to Facebook to Drop Box. Although organizations can still compel their internal users toward their own portals for access to enterprise applications and processes, person-centric activities such as collaboration and knowledge management tend to split off into numerous silos. This trend raises risks for the enterprise, creating new and more widespread privacy and compliance concerns, as well as new levels of knowledge and information management chaos. Rather than using portal technology only to gather value for themselves, enterprise IT and business organizations must ensure valuable and engaging experiences for their end users, whether they're employees, partners, customers or citizens. Clearly, IT organizations, their business leaders and their end users need platforms that offer value and provide a balance of control and flexibility. Portal vendors are quickly realizing that they must enable flexibility and manageability by business users. They must offer social experiences and mechanisms that enhance usability and ensure end-user adoption of their products. Meanwhile, enterprise portal vendors must bring the appropriate level of user appeal into a productive, reliable, extensible and secure portal environment. The user experience trend also means that portal providers must rely less on consultants, system integrators (SIs) and designers to ensure an engaging and productive user experience. That is, they must provide a shorter path to a fruitful user experience out of the box. Portal customers and vendors seeking to respond more readily to business needs are also revisiting and relabeling fundamental portal concepts. To accommodate more business needs, respond to consumerization, delegate capability to the business, improve extensibility and interoperability with third-party providers, and cultivate developer and vendor ecosystems, many portal providers are building or reviving their portlet catalog capabilities. Some vendors are starting to refer to them as "App Stores." Now that consumers and developers alike have grasped the concept (largely through their smartphone and tablet experiences), the market seems ripe for the concept. Portlet catalogs typically offer portal components, modules, skins, themes, templates and connectors that customers can easily plug into their portal frameworks to improve usability and design, or to offer industry- or application-specific capability. The portlet store concept is applicable to internal scenarios, where organizations want to provision certain capabilities that can be readily and safely invoked by their business users and departmental developers, as well as to external communities, which use the portlet marketplaces to share and sell their components to other organizations. Internal portal app stores can be used to enable IT organizations to deploy useful, compliant and secure portal components that site administrators and end users can then plug into their personal or group sites. Vendors including IBM, Microsoft, Oracle, Liferay, Backbase, DotNetNuke and Drupal support the portlet store concept, and many are relabeling their efforts to align with consumer app store trends. Vendors are also supporting consumer-Web widget standards, including OpenSocial, to leverage widely available components, such as Google Gadgets. The horizontal portal market will serve as a foundation for emerging UXPs (see "The Emerging User Experience Platform"), which provide the integration of technologies used to deliver portals, mashups, rich Internet applications (RIAs), Ajax-enabled websites, Web content management (WCM) and mobile applications. This integration can take the form of a set of separate, yet integrated, products that can be delivered as a suite or as a single product. Early examples of UXPs are largely derived from traditional portal technology, and include Microsoft SharePoint, Oracle WebCenter and IBM's broadening WebSphere Portal, with its related collaboration and content management portfolio, which is evolving toward a more cohesive UXP. Although a dozen years of evolution and consolidation in the portal market have brought us sophisticated and versatile products, they've also brought functional bloat and technical complexity. Many organizations want lean portals: simple, more cost-effective products that focus on the portal's primary proposition and provide a personalized point of access to relevant information, business processes and people. Lean portals rely on modern architectures and representational state transfer (REST)-oriented standards for interoperability, often bringing customers faster time to value, without violating software standards in adjacent spaces, such as content management and analytics. The tendency toward lean portals accompanies a desire for lower costs, so it's a space in which open-source providers are playing a more prominent role. The portal market's bifurcation is opening opportunities for software and service providers on both sides of the rift. Backbase and edge IPK, which is new to this year's Magic Quadrant, qualify as lean-portal providers. Although Liferay is beginning to broaden and deepen its portal capability with a view toward UXP, most customers acquire it for its lean-portal qualities. Open-source products such as DotNetNuke and Drupal are also entering the market with a lean proposition. Salesforce.com enters this Magic Quadrant combining a lean proposition with a software as a service (SaaS) model, which is aimed at lowering costs, easing accessibility and ensuring adoption. On the UXP side, although they didn't meet the criteria for this year's portal Magic Quadrant, vendors such Adobe and Cisco loom large as potential players in the emerging UXP market, entering via content management in Adobe's case and collaboration in Cisco's. · Vertical portals focus on accessing specific applications or business functions. · Horizontal portals integrate and aggregate information from multiple cross-enterprise applications, as well as specific line-of-business tools and applications. To be considered for the 2011 Magic Quadrant for Horizontal Portals, vendors must meet a combination of criteria. They need to provide technology supporting deployment in a variety of scenarios, including employee, customer/constituent-facing and partner portals. The vendor must provide sales and support for the portal product in at least two of the following five geographic regions: North America; Latin America; Europe, the Middle East and Africa; Japan; and the Asia/Pacific (APAC) region. The vendor must support clients in more than one industry vertical. DotNetNuke, Drupal, edge IPK and salesforce.com met the criteria for this year's Magic Quadrant for Horizontal Portals and have been added to this assessment. No vendors were dropped from this year's Magic Quadrant for Horizontal Portals. 8 from Microsoft Site here. I think this year Microsoft is planning a huge phenomenal launch wave. 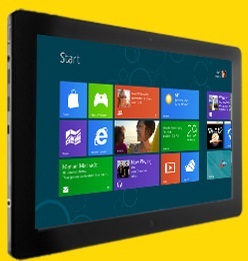 Windows 8 Consumer Preview Released (Windows 8 Beta Download), the next release of windows 8 replacing the expected beta release, you can download it from Microsoft site here. I will download it and try the new amazing features which I have already test some of them in the previous release developer preview version. 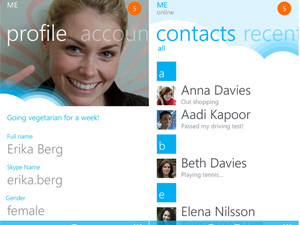 beta version directly from your Windows Phone or at the Marketplace from your computer to test drive Skype for Windows Phone. The new version of Skype brings voice and video calling to Windows Phone users around the globe. I received the above error when extending an existing web application in SharePoint 2010. Search for configuration/SharePoint/SafeMode then change the MaxControls attribute to a suitable value higher than 200, I tried 500 it worked like charm. Setup failed to validate specified Reporting Services Report Server http://Servername/reportserver. Error: The request failed with HTTP status 503: Service Unavailable. The machine was renamed after installing the SQL server. o Choose an existing report server database. o Choose the SQL server using the new machine name. o Test the connection to make sure that the connection is successful. Restart the SQL server Reporting Server service then rerun the CRM installer again. -Windows w2k8 R2 Ent x64. -Using SQL Server 2008 R2 x64-The local accounts I added to SQL Server both have the rights to create dbs (dbcreator and also sysadmin)-Windows Firewall is off (this probably isn't a factor)-I checked the version of Geneva Framework I have in assembly and it was 1.0.0.0. anyway, but I uninstalled this via Add/Remove, rebooted server, installed again, no luck.-At the farm credentials stage, I am using the following credentials: Name of Windows account I am using (eg Hany, but not ComputerName\AccountName), and the password to login.-When I installed SQL Server, I added the Administrator local account and my named local account but also with mixed auth and a password.-I am running a fully updated version of Windows Server. I haven't installed the other updates mentioned in various posts. · Make sure that your machine name is limited to 15 bit to be within the NetBIOS naming limits.